When I was growing up, I was your stereotypical Nintendo Kid. Sure, I knew of the Sega systems and I had played them from time to time, but I never owned any of their systems aside from a pair of Game Gears that a well-meaning grandparent sent my brother and I for Christmas. Knowing this, you would also be able to extrapolate that I grew up playing Contra, the seminal co-op shooter we all know, love and memorized the Konami code for. Why am I bringing up Contra in this review? The reason is simple: Gunstar Heroes ruined Contra for me. The very first time I played this at a friend's house, I knew the game had changed. I couldn't go home again. 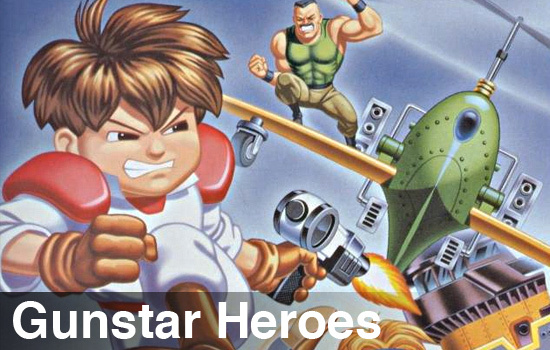 Gunstar Heroes, with its mix of shooting, melee combat, weapon combination and wild bosses is a perfect storm of classic gaming goodness. Taking up the roles of either the "red guy" or the "blue guy" (who, as any smart player knows is the better choice), you and a friend can brave the strange worlds that make up planet Gunstar-9. Seriously, one of the levels is actually a gigantic board game and you have to roll a die to advance! 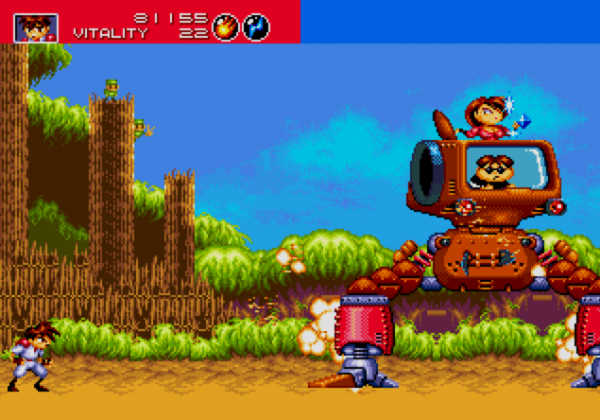 At the time, several innovations to the side-scrolling shooter were brought to the table by Gunstar Heroes. First off, when selecting characters, each player may choose between "Free Shot" and "Fixed Shot". The former allows a player to both move and shoot (are you listening, Resident Evil? ), while the latter forces you to stand still while firing, but you are able to aim in eight directions. Additionally, players choose their starting weapon- which was unheard of at the time, and when a second weapon is obtained, you may combine the effects of both to create hybrid weapons. My personal favorite is a homing flame thrower. Another welcome change to the status quo was the ability to choose any of the first four worlds to start out on. Finally, one-hit kills were thrown completely out the door. Players had life bars, allowing them to take a few hits before an untimely death, and healing items were placed throughout the stages, allowing a quick reprieve before boss fights. And the boss fights! From 3d sandmen to giant plants to transforming bosses with seven forms, these are some of the finest bosses ever put forth in the 16-bit era. The aforementioned level select function allows you to return to bosses you're stuck on quickly, rather than slogging through several levels in order to perfect your pattern recognition skills. This particular release of Gunstar Heroes allows for online co-op, which works as well as advertised, though with games of this type, couch co-op is probably the best way to go. It's an absolutely timeless shooter, and if you weren't around to experience it you need to be prepared to snag one of the best five-dollar purchases you'll ever make. The Co-Op Experience: Team up by choosing one of many characters through this unique side scrolling game. It's similar to Contra, but with quite a bit more depth.